This coffee will be fresh roasted for you. We expect Taylor Maid Farms will roast and ship this coffee in 1-2 business days depending on their roasting schedule. This is the Sonoma Roast Organic Blend brought to you by Taylor Maid Farms. The Sonoma Roast features high quality coffees from some of Taylor Maid Farms' favorite origins, like Peru, Nicaragua and Sumatra. This combination of coffees create a unique harmony of flavors that are greater than the sum of its parts. Enjoy the creamy, rich cup with notes of roasted chestnuts and hazelnut. Solid blend but I was expecting a few more flavors. Fine but no flavors really stand out other than...well coffee. Roast date indicates over a month old when received. Not bad but some harshness in the finish. Full of flavor - love that creaminess. Has a good "kick" to it. We most enjoyed that it wasn't sweet like many of the other coffees we've received. This coffee was absolutely delicious. I loved the creamy, richness and it really worked well in both my Aeropress and French press. Great blend. Well balanced too! enjoyed the low acidity and full flavor of this blend. Excellent! This one is right up my alley, very nutty and earthy. One of my favorites so far. This is the best coffee I have had from you guys. The closer we can get to this profile, the better. It was amazing! Not very bold or flavorful. Easy to drink but just OK. I love this coffee! Very smooth and great notes. I just really like this brew, it's very smooth, silky smooth in fact. The taste is flavorful without being overpowering and is good both black and with cream or sugar. Wow! This is the one that I have been waiting for, this may be my new every day coffee. I like this coffee. It is better than the past 2 selections. I would agree it is a rich and nutty flavor. Enjoyed this one as much as the Redcab! One of the best coffees I've ever tasted. It's so well blended I would have thought it was single-origin. This is the best coffee I've received so far. Very good, smooth. Love the nutty-but-not-too-nutty-ness of it. This was alright, very smooth, I liked the smooth creamy taste. It was a simpler coffee and I liked it. This is in the middle of the road of flavors, richness, and style. It's nice but before this arrived, I was drinking a Verve single origin Panama light roast. The comparison stayed with me as I drank through the Sonoma Roast. True to the label notes, this coffee is nutty and roasty. I think I'm in the mood for something more floral at the moment. Loved the flavor, perfectly roasted! I liked the nutty taste, could have been a little darker in flavor. Very nice in the aeropress, not as much luck in the pour over. Pleasant, if subtle, taste. Certainly not the best, but very drinkable. The nutty and smooth flavor of this coffee was excellent. I really enjoyed it. A little better... but you are still way off on the taste... please look at the recommendations and reviews for what I like .. you keep shipping stuff I am not liking... thank you ! It is a very good coffee, with a great aroma, though I prefer a little bit darker and stronger brews. Fantastic flavor when used with immersive brewers. Really liked it in the aeropress (inverted method). However when brewed utilizing the chemex or expresso machine, did not enjoy it as much. Smooth taste, but lacks aroma. The best part of that morning brew is inhaling before your first sip. Very smooth and flavorful. I liked it better than the previous coffee. The bean color is about what I'm used to although I also like a darker bean as well. I just got a new conical burr coffee grinder and I am still playing with it to get the coffee strength the way I like it. The Sonoma roast is by far the our favorite. I think previous coffees have had more acidity for lack of a better description, which neither my husband nor I prefer. (I clearly need more coffee education!) That said, more roasts like the Sonoma roast would be wonderful. Not bad, but fairly average in my opinion after the first couple coffees. Maybe I'm not crazy about the blends? While I prefer fruity, sweeter coffees, this was perfect for adding cream and sugar. It was easy to drink, not too complex, but smooth. It made a perfectly decent cup of coffee. We prefer darker coffees with more profound tasting notes. But it was fine coffee. 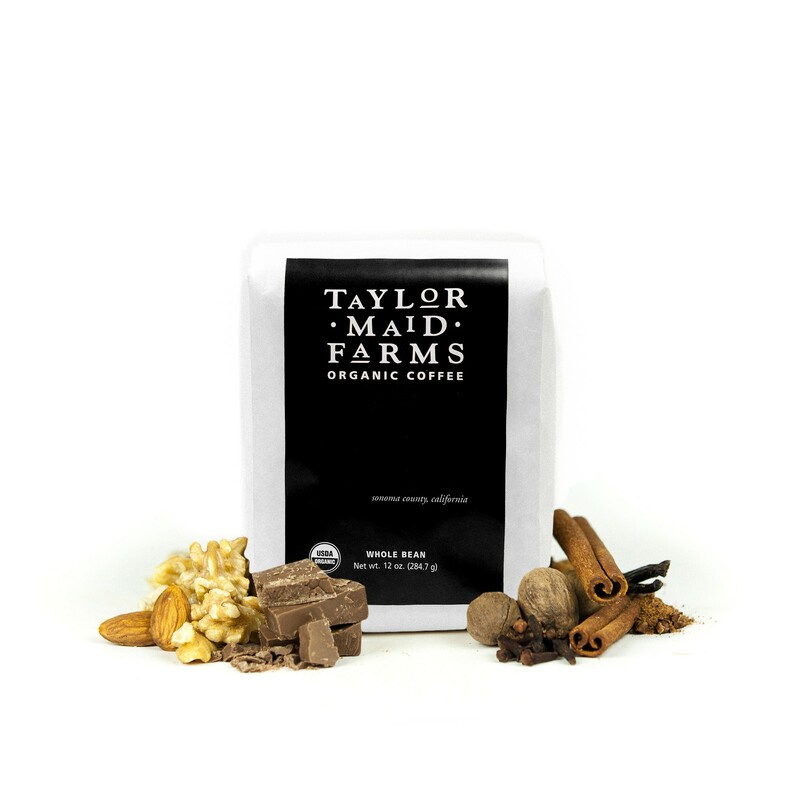 The Sonoma Roast from Taylor Maid Farms is definitely a welcome addition to my coffee tasting experience. I enjoyed the nutty flavor which was not too overpowering but yet, rich enough that I was getting the notes quite easily. I wouldnt say this one was an all time favorite but its smooth flavor still delivered a great taste and experience. I could totally notice the nutty flavors. I am almost always a fan of earthy flavors, so this was a pleasant experience. I didn't feel like it was acidic at all-the creaminess was perfect in latte form, or my usual morning black. A great first MistoBox experience. Thanks for the suggestion Connor! Generally weaker then I usually like my coffee, but it does have a good flavor. We very much enjoyed this blend. It was smooth with a delicate nutty flavor, which we love. The aroma was captivating and true to the taste. We found the brew to be just a bit too light for daily "rev-up your morning" drinking, but this blend made an excellent after-dinner, wind-down, relax the day way cup. Definitely a blend we would recommend and get again! On the overpowering side. Agree with the tasting category of "rich". However, I miss some of the nuanced berry/bright/acidic flavors of other boutique roasts I tend to gravitate toward. One other note, I noticed that the retail price on the roasters website is about ~25% less than the average price per bag for my current MistoBox subscription. Is the idea that some coffees will be above the average price to net it all out? It would be a shame to be paying a premium compared to what I could purchase direct, as that would seem to diminish the value of a MistoBox subscription. A little mild in flavor, neutral, balanced. I think I'd like to try something a little more or a lot more nuanced. I found the nutty flavors a bit sour. An okay coffee, but nothing fantastic about it. It was mostly ok but good for a latte. I really didn't like this coffee. It was SUPER bitter. I tried brewing it with Chemex, V60 and AeroPress but never got a good cup. I'm not sure if it was the darkness of the roast, or what the problem was but I didn't enjoy the flavors. This was a great choice for me. I loved that it was organic. The flavor was just what I like, but maybe just a bit stronger? A little darker flavor, maybe? I don't like bitter, so I'm not sure if I am describing this quite right. Thanks again! This was a good coffee, It was somewhat bland in taste for me. Fairly dark and chocolaty and creamy, but not as complex or subtle as other coffees. Definitely a great cup of coffee though! I used a Chemex Ottomatic and the coffee was good, but not great. This morning I used an Aeropress and it was quite a bit better. Not sure how to adjust the Chemex to achieve a similar result. Using a Baratza Virtuoso set at 18 for the Chemex and 13 for the Aeropress. Three tbsp on the Chemex for 3 cup level. 1.5 scoops for the Aeropress. This coffee tastes best with sugar and milk. With only a little milk, I find it a little bitter. The nutty flavor really comes out with a small bit of sugar and a good amount of milk. I brewed it in a 20-oz. French press with 3 rounded tablespoons of grounds for 3 minutes at 195 degrees F. It's yummy! I thought this coffee tasted great! Very smooth, not acidic at all. Good full flavor without being a dark heavy roast. I feel the coffee is a little past medium roast for me. When brewed it smells more like french roast. This coffee reminds me of dinner coffee, drinkable but not my favorite. I can't imagine it getting better. Truly, this was home run. I love this coffee. Loved it! This is absolutely wonderful in aeropress. I really enjoyed this coffee. Love the notes of roasted chestnuts and hazelnut! Makes a very balanced, creamy cup! I've rated this at 3 stars mostly because it's a good starting place. I plan to finish the bag and update my review. I tend to like something a little stronger, but this is a smooth creamy cup of coffee that I enjoyed. Anybody that likes hazelnut will love this coffee. So for now I'll say good coffee just not what I tend to like. Honestly this coffee was a little light for our taste. Was hoping for a little richer, darker flavor and scent. Next time! Liked he subtlety- nice and smooth. Strong but not bitter. Liked it. A little smoky flavor. and mildly nutty. It actually tasted better as a drip machine brew rather than my usual Aeropress method. Not enough sweetness to be an every day "go to" cup but it works with milk drinks. I'm gonna try as a cafe au lait next. Such a smooth cup of coffee! I'm a coffee novice but really enjoyed this blend! Brewed in a french press with a dash of cream and it was perfection in a cup. Absolutely delicious coffee. Really smooth. Very smooth cup of coffee without a lingering bitter taste. Subtle tastes of hazelnuts, much lighter than a cup of hazelnut coffee which is good. Very good, could drink multiple cups of this in one sitting. Much better than the house blend. I am use to darker roasts. I like bold without being bitter. Very enjoyable blend. Had a rich, creamy flavor perfect for a latte. This is a great blend- rich, nutty, not too dark. Very well rounded, not acidic or sharp. Good roast level, fairly flavorful, very smooth. Very nice cup of coffee. Smooth. I wasn't a fan of the flavor profile of this roast. Please do not include in future shipments. Thanks! Good! I could definitely detect a strong aroma of this coffee. Still working on learning tasting notes, but I did enjoy drinking it in the morning and after long hours of work. I am looking forward for the next surprise from you, Samantha! I am giving it 3 star as a future basis for my evaluation. I will be comparing all sorts of coffee using Sonoma as a base. Thanks a lot for your work! This is exactly the type of coffee I enjoy. Perfectly balanced. Loved this first selection for my husband and I. He's more of a dark roast only drinks it black and I am a medium smooth roast with a bit of cream and raw sugar type. This one matched us both very well. I liked the smooth and nutty flavor. A better grinder made this coffee much better. It was a good bent of mild and nutty. Beautiful roast. Creamy, well rounded. Big fan. Great blend of coffee! Enjoyed every cup! I loved this blend! It was definitely the smooth taste and low-acid finish that I enjoy. This is towards the dark end of medium - that beautiful chocolate brown bean, with just a couple glints of oiliness . A strong smoky aroma from the beans made me nervous, but when brewed pour-over style the cup came out perfectly medium bodied. Roasted chestnuts and hazelnuts is spot on. This is a soft, nutty cup with mild acidity and a round texture. we both really like this. Not too bitter, and doesn't taste like an ashtray (sounds like a low bar but isn't). Is full-bodied. My husband would prefer a bit darker, but this is perfect for me. Much better than the last. The nuttiness was noticeable with a little chocolate aftertaste, especially when it gets cool. **UPDATED** I've updated this review to 4-stars because of how much my wife and I loved this coffee after we were finished with the bag. It really grew on me. This makes a great, quality cup of coffee. I can tell they really took time to balance the flavor. But nothing about it really stands out to me, though, and I think by the time I finish the bag I think I'll be bored of it; that's why I'm giving it three stars. Seemed lacklustre to me. Not extremely bold or bright and not a lot of distinguishable flavors. Wonderful cup of coffee for my first in the subscription. Loved the creamy, nutty flavor. Not a huge fan of the length of the roast. This coffee did not "age" well, after a couple days it started to taste like Folgers. This coffee was darker than I was used to but still had an enjoyable flavor. I brewed with a Chemex. A good coffee, but not one I'd return to. Smoky, organic, and earthy with a full body. Brews well on Chemex and V60. Pretty good! Could definitely smell the hazelnut and cashew(?) right out of the gate. Still working on learning tasting notes, but I did like most of it. Excellent first box! I have been using an electric drip coffee machine to make this. I'm rating this a three because its the first roast I've gotten from you, that way I can move a star up or down using the flavor of Sonoma as context. For example (personally Blue Bottle Coffee from San Francisco is my favorite roaster with there NOLA iced with Chicory being one of my favorite things to get there.As for this particular roast. I really enjoyed it. I brewed it in a maker that burr grinds and places the proper amount of grinds in the filter and then I can choose the brew strength (light, medium, strong.) I usually choose strong because I typically choose a medium to light roast to maintain caffeine content then brew it on the strong setting to get a bolder flavor from the lighter roast. I'm not sure how many people do the same but its at least serves as a control to taste different coffee flavors while minimizing variables as much as possible. So as you have probably realized by now, I'm not the Foldger's or Maxwell House coffee drinker. I basically know how much work goes into putting that liquid in my cup and I'd like to show those -- that pick it from the tree to the roaster-- a bit of respect that goes into the process. Thus my first taste of any roast is without anything added to the coffee (typically I'm a small amount of 2% milk (I'd drink it black but its not worth it to me on the stomach to drink the whole cup that way, so I soften it up a bit) and a very small amount of sugar. Well sorry this review was so long but its my first one so I'll focus on brevity in the next one. Fine, though not my style. I like more fruit dominated coffees and this lends more towards roast flavors. Solid quintessential coffee. Very baseline flavor. It's all a coffee should be and nothing more. Enjoyed the taste and aroma. Very pleasant flavor, with no aftertaste. Just love this unique flavor! You will love this in the morning, afternoon and evening. It was okay, nothing excited about it. After the first two days it's flavor was generally bland. Not sure if this batch was over roasted or what, but it just didn't really have any unique or exciting flavors to it.I made it on different grinds and temperatures in an Aeropress, Hario cloth pour over, and Moka pot, and none of the combinations really brought it to life. Love the flavor of this coffee. Has a nutty taste with a hint of chocolate. I liked this blend a lot. Well balanced coffee. I like the caramel and smoky notes in the roast. Not acidic/sour. Could use a little bit more richness/body. This blend was just not for me. It was roasted darker than I prefer and nothing particular stood out about it. Love it! Favorite one so far. Brewed. Really enjoyed the bold, nutty flavor. Absolutely love the flavor of this coffee. It's sweet undertones and nuttiness is fantastic. This is a good start to my membership here and I look forward to getting more coffee. Good. Wouldn't say my favorite. Am not a fan of the roasted chestnuts and hazelnut. Very smooth and creamy. This was excellent. I really enjoyed it. This is by far the most enjoyable cup of coffee I have ever had. It is sweet and smooth. I usually add creamer and sugar, but enjoyed it without! I will be sad when I run out!!! Really liked this coffee. Tasted smooth and no harshness. Good cup of coffee in the Aeropress. The roasted chestnuts really shows through. A little more creaminess would make this an amazing coffee. Liked everything about this one. I really like the nuttiness. I'm not sure what did't quite click with me on this one....? I'm looking forward to playing around with the temperature for my french press and the amount of beans for the drip. :) My rating may change after that. Nothing specifically wrong with this Coffee Drinkable (but not for the $18 price tag.) I would look for this coffee next to folders in the grocery store. Seemed very neutral in flavor without any pronounced notes. on the plus side not acidic at all. Love that about it. Pretty smooth. Very robust after a good 12-14 hour cold brew. Pour over was nice. Never did an aeropress 'ing of it. Decent but not outstanding. I found it to be relatively solid and well-rounded, but I wouldn't go out of my way for it. This was pretty tasty, but it didn't really have that sweet flavor I enjoy from coffees with a bit of vanilla or fruit. I liked it. It won't go down as a favorite, but it was enjoyable. I didn't like the hazelnut taste. Another coffee I like is Black House from Modern Times Brewery.